The irrigation pump is responsible for providing the necessary flow to the irrigation system to the required pressure by issuers for proper operation. Motorpumps: They use liquid fuel for operation as they use combustion engines. Fuel required is usually gasoline pumps in case of small horsepower or diesel for higher power. The use of one type or another depends on the access of the farm to the electric current supply, and preferably pumps are installed in sprinkler heads for its economy. Submersible pumps: Used when the irrigation reservoirs in order to eliminate problems suction when the suction lift is high. Well installed in the reservoir surface using floats or attached in a vacuum chamber which is filled by the principle of communicating vessels. No Submersible pumps: standing on the ground surface and they are used when the suction is low or just there isn’t any, because the pump is installed in a lower height of the mouth of the suction height. Horizontal pumps: used to provide high flow rates and low pressures. They are the most common pumps installed in sprinkler heads. Vertical pumps: provide high pressures. The frequency converter is a system for controlling the rotational speed of an AC motor (AC) by controlling the frequency of power supplied to the electric motor. That is, a frecuency converter is a special case of a VSD. 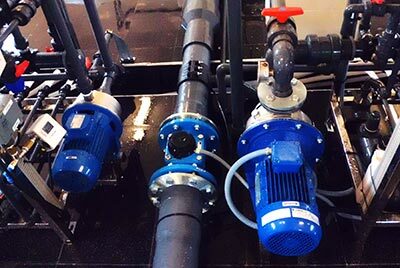 Starting and stopping the pump paused to avoid large overpressure in the beginning of irrigation situations that may cause water hammer in the pipes. Furthermore, by preventing full voltage starting of the engine, high consumption that occurs at the beginning of irrigation is avoided. The change of flow according to the needs of different irrigation sectors.